Mordian 7th Regiment: 40k Genestealer Cult - Leman Russ Exterminator painting begins! 40k Genestealer Cult - Leman Russ Exterminator painting begins! The intent is to have the brood brothers to be a PDF force, using older variants of the military vehicles. 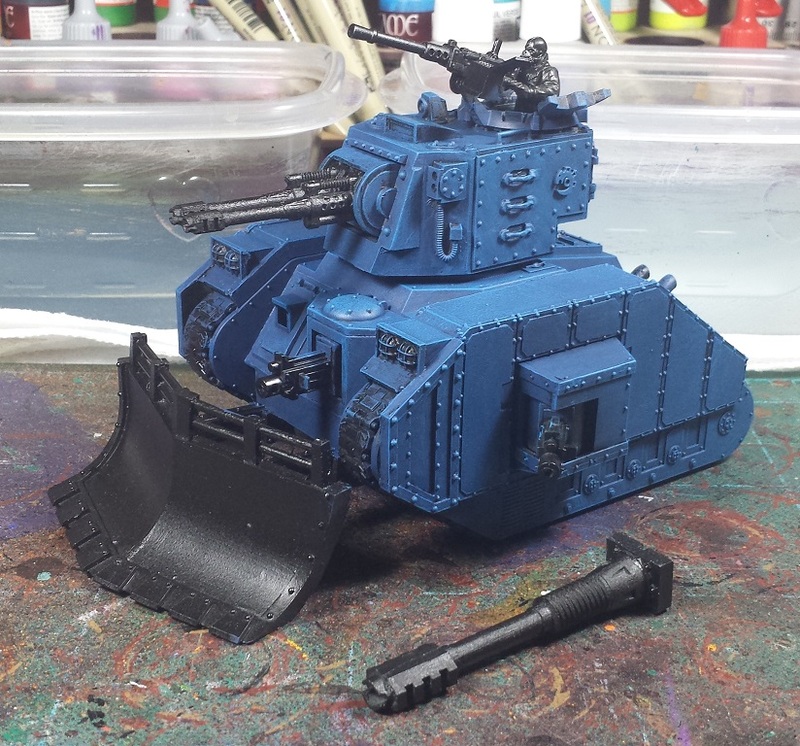 As a callback to the color of the carapaces on the Purestrains, I'm going with blue tanks (the guardsmen will have fatigues in the white similar to the armour of the hybrids and blue armour) which may be a bit of an unusual choice when seen on its own but hopefully it'll look cool laid out with the army as a whole. We'll see! 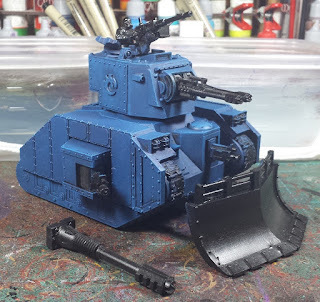 Is the tank armour scratch built looks awesome! If most people said they were painting a purple tank, I'd be worried. You say it and I can't wait. Bring it on! Where'd you get that turret and side armour? They're stellar. Great looking tank, and blue might be more easily incorporated if you gave it sort of a "police" look, so big white stripes, labels and so on. @CJ Kilbride: The turret and armor are from Blood and Skulls Industries (on eBay), he does a ton of cool tank add-on kits - primarily for Baneblades, but some neat chimera and leman russ kits. Highly recommended! @Lasgunpacker: Indeed, it'll be getting some white detailing, and the weapon housings will likely end up in yellow to help tie the colors in to the hybrids. Crazy colors ahoy! Oh now thats a lovely shade of blue - I like that a lot. The add-ons look great too and really give it the look of PDF equipment, or older, second line unit equipment. I particularly like the high turret. Admirable speed and work chief. Meatie hunk of metal. Will look great with the yellow mining thingies. Are you planning to do any camo on it or it will just be blue? I love the KV 2 look to that turret. I might have to order one. @Frothing Muppet: Thanks man! I'[m pretty happy with the older-mark look it has! @Rednekkboss: I'm well pleased with the kit, it was a breeze to put together! @Zzzzzz: Indeed, he does great kits!